Coombabah Lakelands Conservation Area protects more than 1200 hectares of wetland, eucalypt forest, salt marsh and mangrove habitat. The area is ideal for short and long walks, bike riding, trail running, bird watching and native wildlife spotting. You can expect to see a variety of wildlife including kangaroos, koalas, owls and grey-head flying foxes. In total, the Coombabah Lakelands Conservation Area is home to over 274 animal species and is an important coastal wetland and migratory waterbird habitat, so you can also expect to see lots of bird varieties during your visit. Living on the Southern end of the Gold Coast, I often spend my spare time exploring the south: Northern NSW, Dreamtime Beach, Byron Bay, Minyon Falls, Mount Warning, etc. It isn’t often that I venture to the northern end of the Gold Coast, so I was excited to explore Coombabah Lakelands Conservation Area. 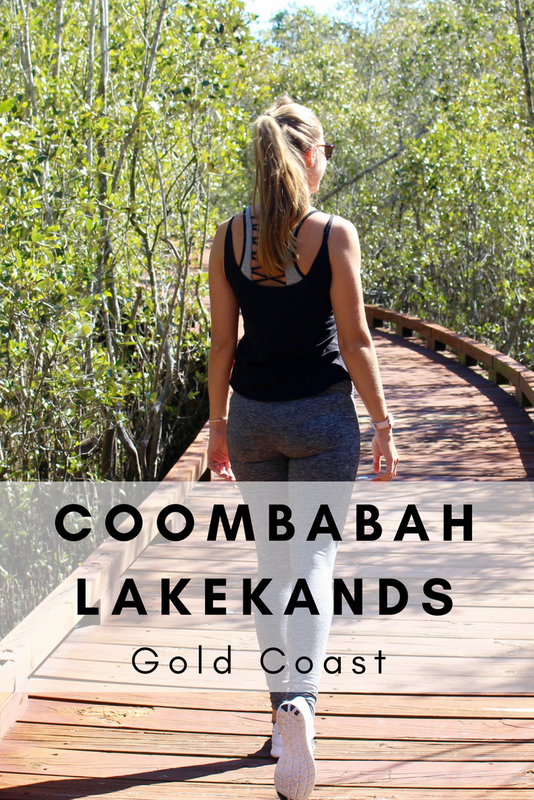 I enjoyed my visit to Coombabah Lakelands but have to admit that there are many other places I recommend checking out before heading here, especially if you have limited time. There are several sections to be explored within Coombabah Lakelands Conservation area. 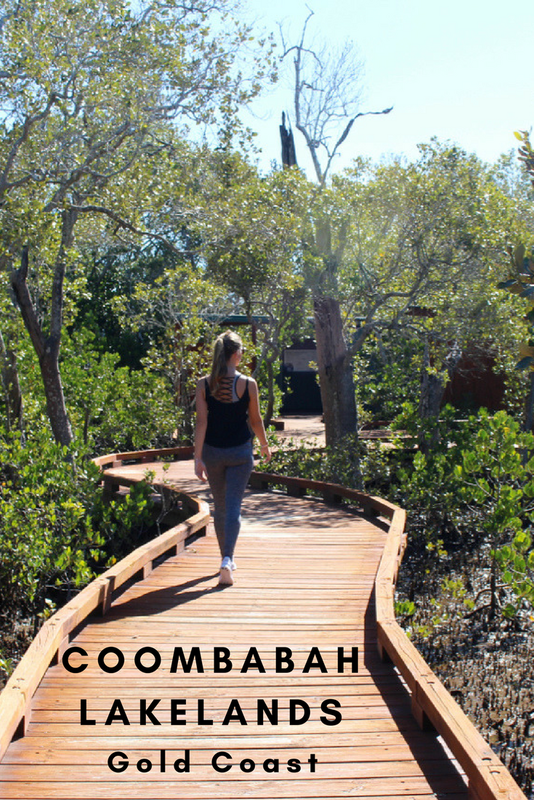 The map below shows you the walking trails and boardwalks within Coombabah Lakelands. As you can see you are spoilt for choice. I suggest Mangrove Boardwalk as your first stop. To make the most of your day at Coombabah Lakelands conservation area, pack a picnic and explore several walking trails. They offer varying scenery including lake and river views, boardwalks, native Australians forest, and wildlife sightings. We explored two parts of Coombabah Lakelands Conservation area, the Coombabah Reserve and Mangrove walk on Shelter Road and the Coombabah Lakelands Nature Reserve. Please note – all walking trails within Coombabah Lakelands Conservation areas are suitable for all fitness types and families. We started out at Coombabah reserve and mangrove walk on Shelter Road, which is near the animal welfare. From here you will find a short boardwalk trail called the Mangrove Broadwalk. This is a short walk that leads you through the bush to a boardwalk over mangroves and out to a shed on the lake, all pictured below. After we finished this short walk we went to another area of Coombabah Lakelands. The walking trail was called Myola Boardwalk which leads onto Boundary Track (see map). This was a five-minute drive from Shelter Road. The walk started as a boardwalk over the water then turned into a path beside the river, which is where we came across a massive Kangaroo. This area is full of Kangaroos and native wildlife. Like I said, I enjoyed my trip to Coombabah Lakelands, but recommend many other things to do on the Gold Coast before this. If you take rubbish with you, make sure you take it home with you. Watch for snakes as they have been spotted in Coombabah Lakelands. If you’re lucky you may be able to spot koalas, kangaroos, echidnas and other wildlife on your hike. Pack a picnic to enjoy in Coombabah Lakelands, or head to Harbour Town after your hike for lunch and some shopping. There are no toilets or drinking water available within the conservation area. If you found this guide to Coombabah Lakelands Conservation Area helpful, please pin it for later. Looking for something else to do on the Gold Coast? Disclosure: This post on Coombabah Lakelands contains affiliate links.